Following is my graphics portfolio, some of these items were custom designed graphics requested by my clients and the rest were designed for my own web pages. 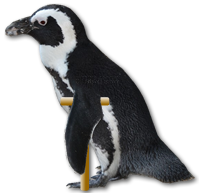 The background and wing was removed with the lasso tool, a wooden crutch designed and placed under the wing to symbolize a penguin with an injured leg for an article on recovering from a Google Penguin penalty. This star was produced with the star tool in Fireworks with a drop shadow added under the star and text applied on top. 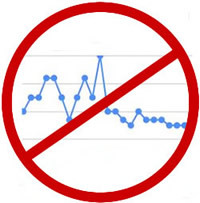 This circle with a slash across it was designed to symbolize preventing a drop in traffic on a website. The graphic on the right was designed for the Shopping Cart SEO page. I found the public domain shopping cart graphic on the Internet and distorted it so it wasn't horizontal. I also made the background transparent. Then I set up the word "SEO" in a large font and distorted that also so it was on the same plane as the shopping cart and placed it under the cart. The trash can was designed using a public domain image of a trashcan on the Internet, removed the lid with the eraser tool and found another image of a piece of paper and tilted it the way I wanted then placed that over the trash can image. This is an image of 3 stars on a transparent background with a drop shadow under the stars, made in Fireworks. I've placed them in a div with a blue background. I occasionally use this for 4th of July special sale notices. A drop shadow was placed under the whole image using CSS. This image of a US flag has a rectangle with rounded corners over it with a semi-transparent background and drop shadow under the rectangle so it stands above the flag. Text is printed on top. I applied a drop shadow under the whole image using CSS. This is a 3-D box with a daisy applied to the corner and then 1/2 of the daisy distorted so it looks like it was bent around the corner of the box. 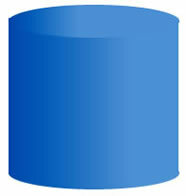 This is a cylinder with a gradient fill applied so that it has a 3D effect. This image is a semi-transparent arrow designed to go over video thumbnails. This image was designed in Fireworks with a gradient fill on the arrow. It is set to go on a white background. This Jewish Star of David, designed for a member of Endtime Poetry, was used to depict Messianic Judaism. It was made in Fireworks using straight lines in the shape of a triangle and then copying it and inverting to make the 6 sided Jewish star of David and then making smaller triangles to go inside then filling the whole thing with blue color. The Christian cross was made the same way except filled with a wood grain pattern. This scroll was designed as a symbol of a story teller. The basic outline of the left edge was drawn with a pencil in Fireworks and copied and the copy moved to right of page. Then interconnecting lines were drawn between the two sides and excess lines erased. Then the pen tool was used to outline separate parts in a darker color to be filled with the paint bucket tool using vector graphics. Then a gradient of darker colors on the ends was applied to the image making it appear as shadows under the rolls. Then the letters were added and transformed with the "skew" tool making the right edge of letters appear farther away to provide a distance perspective. This hourglass, designed for a member of Endtime Poetry, was made in Fireworks and assembled in several stages. The base and top separately, then one globe was drawn and copied and the other globe was placed above it upside down. The globes were attached together, sand added (using a colorful fill) and empty spots filled with rubber stamp tool. Then the base and top of hourglass were copied and pasted onto the globes covering the bottom and top. And bars were placed along the sides. And finally the whole image was tilted. This is a circle with highlights so it looks like a 3D sphere with a drop shadow underneath. The images, photos, animations, logos, etc., i.e., all grapics designed by Lori Eldridge utilized on this site, are under the exclusive ownership of Lori's Web Design. You can purchase ONE TIME RIGHTS to use them one time only on your web site or other medium. Please contact for more information.